For three decades, James Balog has been a leader in photographing and interpreting the natural environment. An avid mountaineer with a graduate degree in geography and geomorphology, James is equally at home on a Himalayan peak or a whitewater river, the African savannah or polar icecaps. To reveal the impact of climate change, James founded the Extreme Ice Survey (EIS), the most wide-ranging, ground-based, photographic study of glaciers ever conducted. The project is featured in the highly acclaimed documentary, Chasing Ice, which won the award for Excellence in Cinematography at the 2012 Sundance Film Festival, as well as dozens of awards at film festivals worldwide. 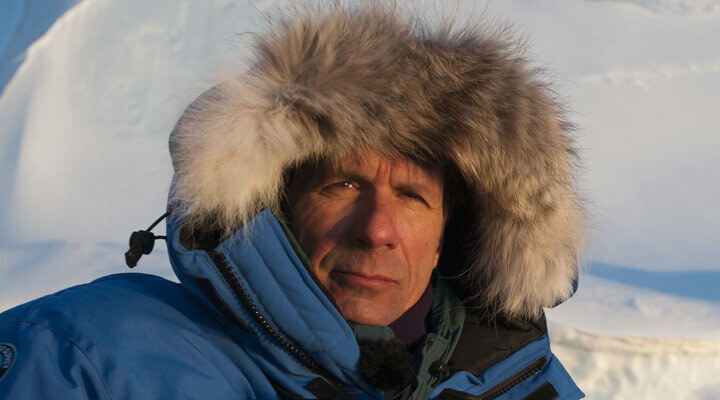 Chasing Ice was shortlisted for the 2013 Academy Awards. It has been screened at The White House, the U.S. Congress, the U.K. House of Commons and the United Nations. It has been the subject of features on the NBC Evening News, ABC Nightline, The Late Show with David Letterman, PBS’s Moyers & Company, and Real Time with Bill Maher. James has been honored with many awards, including, in recent years, the Heinz Award, the Missouri School of Journalism's Honor Medal for Distinguished Service, the Aspen Institute’s Visual Arts & Design Award, and the North American Nature Photography Association’s “Outstanding Photographer of the Year” award. He recently received an Honorary Doctor of Science Degree from the University of Alberta and the American Geophysical Union Presidential Citation for Science and Society. James is the author of eight books. ICE: Portraits of Vanishing Glaciers was published by Rizzoli in 2012. Among his other titles are Tree: A New Vision of the American Forest and Survivors: A New Vision of Endangered Wildlife, hailed as a major conceptual breakthrough in environmental photography. James’ work is in dozens of public and private art collections, including the Museum of Fine Arts Houston, the Corcoran Gallery, the Denver Art Museum and the Gilman Paper Company. He has been extensively published in most of the world’s major pictorial magazines including The New Yorker, National Geographic, Life, and Vanity Fair. National Geographic showcased EIS in major features in 2007, 2010 and 2013. EIS is the subject of a 2009 NOVA/PBS documentary, Extreme Ice. Nature is changing, right before our eyes. Through my work, I am committed to bearing witness to these changes. Ilulissat Isfjord, Greenland, photographed in August 2007. Columbia Glacier, Alaska, photographed in June 2009, Layers of eroded sediment stripe an iceberg. Mendenhall Glacier, Alaska, photographed in September 2010. Greenland Ice Sheet, Greenland, photographed in July 2008. Silt and soot blown from afar turn into black "cryoconite," absorb solar heat and melt down into ice. Meltwater lakes and streams on the Greenland Ice Sheet east of Kangerlussuaq. Scientists believe that meltwater processes on the surface and base of the glacier are critical pieces of the puzzle in trying to understand how large masses of ice have disappeared extremely in eons past in North America and Europe—and may well do so again here in Greenland. Jökulsárlón, Iceland; March 2009. An 800 lb. iceberg polished by the action of glacier, river and seawater seen on the beach in a tidewater lagoon. The chunks of ice have been dubbed "ice diamonds" by James Balog. Jökulsárlón, Iceland; September 2007. High tide brings an endless procession of ice fragments onto the beach. These "ice diamonds" are unique sculptures created when they tumble in the surf and onto the sand. They will vanish during the next high tide. An EIS team member provides scale in a massive landscape of crevasses on the Svínafellsjökull Glacier in Iceland. Jökulsárlón, Iceland, photographed in 2008, showing 500- to 700-year-old ice calved from Breidermerkursjokull, polished by the action of glacier, river and seawater, on the way to raising global sea level, seen on the beach at the mouth of the stream draining the Jokulsarlon. Extreme Ice Survey time-lapse cameras in action, Columbia Glacier, late August 2009. See more of james' work on his website at www.jamesbalog.com. Learn more about James' work documenting global warming at the websites www.earthvisiontrust.org, www.extremeicesurvey.org and www.chasingice.com. Follow James' causes on social media: Facebook, Instagram and Twitter. Conservation photographer James Balog is a Nikon Ambassador. Learn more about his photography.